"Growing up in NYC, playing ball and being fly were the most important things to me and my peers. We all wanted to be in the NBA and dress the best. I wanted to combine the two as a tribute to our childhood." Mr. Refined just published its editorial #StyleAboveTheRim, men dressed in suits playing basketball with the tagline: "Ball is Life. Fashion is Life." 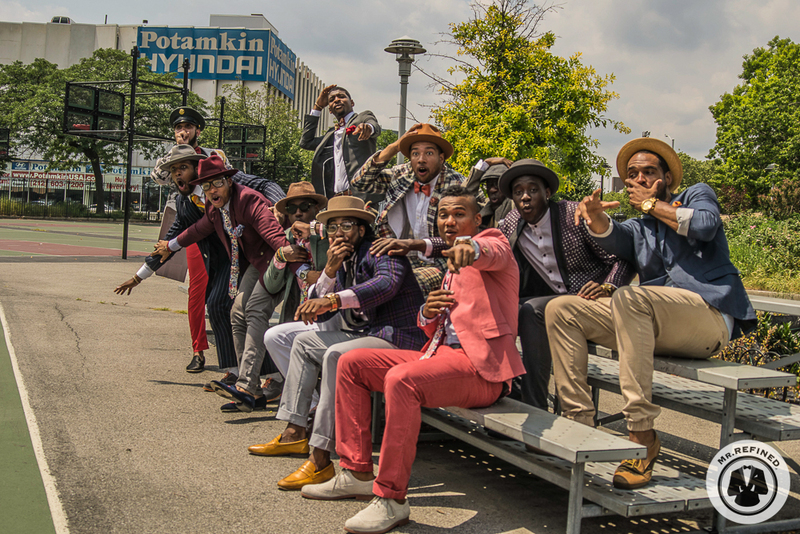 Harlem is reclaiming its throne as the fashion center of the world and Mr. Refined is leading the charge. As Dapper Dan once said, "Outside of NY, everyone wanted to be like NY. Inside of NY, everybody wanted to be like Harlem." Meet the minds behind #StyleAboveTheRim, Harlem natives Mr. Refined's founder and editor-in-chief, Marc J. Kelly, and the creative director, Romain Barnett. What inspired #StyleAboveTheRim? What were your goals for the photo-shoot? Romain Barnett: Growing up in NYC, playing ball and being fly were the most important things to me and my peers. We all wanted to be in the NBA and dress the best. I wanted to combine the two as a tribute to our childhood. For this photo shoot, we used hats from Flamekeepers Hat Club and leather bow ties from DLeak. The goal of the shoot was to show the impact of fashion and sports on how we live and see ourselves. 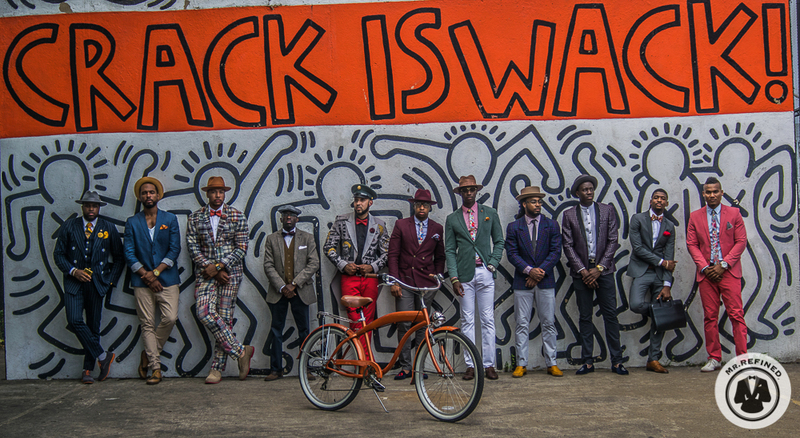 Being well dressed and dapper changes how you are perceived and how others perceive you. Similarly, basketball is a gateway to creating community and bringing people together, allowing one to earn respect on the courts. I wanted to fuse the two because of how they both shape the minds of young men. How do you define style vs. fashion? Romain Barnett: There is a major difference. Fashion has rules. Fashion is the gateway to style. Style is very personal. There is no limitation or outline to follow when it comes to style. Why and when did you create Mr. Refined? Marc J. Kelly: While pursuing my MBA, I ventured into event promotion for young professionals. This lead to the birth of Mr. Refined -- tapping into the under-served market of lifestyle options for the upwardly mobile man of color. Mr. Refined is an incarnation of my style transformation from Sugar Hill to Westchester to Wall Street. It started with fashion. At the time, I would buy a suit and it was too big nor did it express who I was, where I came and where I wanted to go. I slowly started moving towards tailored slim fitted suits, adding my own flair via pocket squares, lapel pins and colored socks. Although some men's magazines may have an "urban" vibe, they do not embrace the fashion inspiration of urban street style. Too many times, the young man of color is typecast as a thug or an athlete. There is much more diversity within our culture. We are present in the boardroom, on the stock exchange, doctors, lawyers, techies, comic book geeks and fathers. Those images are not celebrated or represented. We launched the website November 2013 with a mission to change the narrative of the young urban professional man of color. We want to be the lifestyle magazine the man of color turns to for fashion, style, art, music, brotherhood, culture and community. From Wall Street to MLK Street, we want to represent the man of color -- a rebirth of the modern Harlem Renaissance Man. In addition to the magazine, we host curated events like A Gentleman's Night Out -- Cigar Tasting. Our motto is: Look Better. Feel Better. Live Better. As Creative Director, what is your vision and goals for photoshoots? Romain Barnett: My goal is to inspire, teach and educate men of color on how to be a gentlemen while improving their own personal style. I want men of color to see my work with Mr. Refined and use it as motivation to reach a better lifestyle. What's next for Mr. Refined? Marc J. Kelly: We're creating an Advisory Board of seasoned fashion and magazine professionals to take us to the next level. We're always looking for great writers and photographers to collaborate with. As usual, expect dope editorial photoshoots. 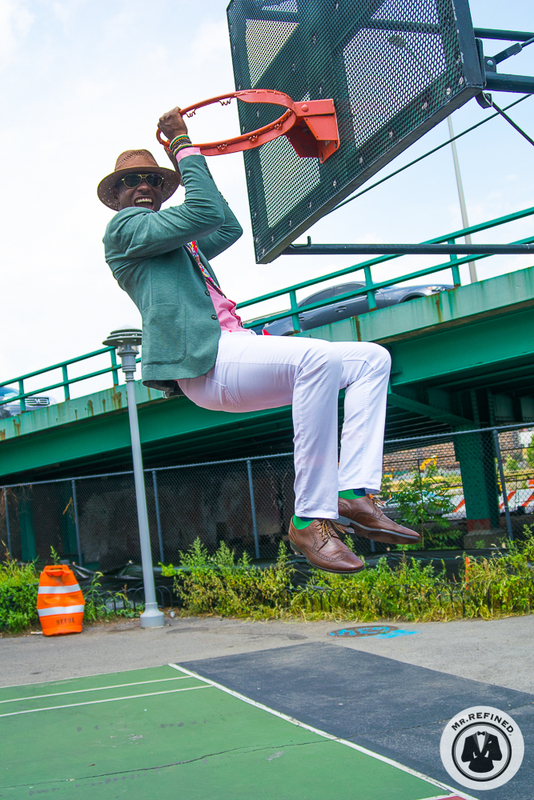 For more pictures, see #StyleAboveTheRim. Check out the behind scenes video below.